Detailed Guide To Buying a 7 Seater Car: What To Look For? If you have a large family you would have definitely experienced the lack of enough spaces in your car. 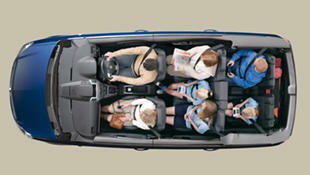 In a regular car you can not fit more than 5 people so therefore bigger families will need additional spaces in the car. Seven seater cars are not only considered family cars but also as a variety of transportation for larger groups of people who wouldn't otherwise fit in a standard car. You will see many minicabs of this range. As there are different reasons for buying them, there are different types of 7 seater cars. There are simple tips to follow to ensure you drive the right 7 seater car off the showroom.  SUV 7 seater cars - to visualise them in the best way picture Audi Q7, Land Rover's Discovery or the Volvo XC90. They are great for family trips and you won't struggle even if you have to go in the mud.  Minivan 7 seater cars - these look more like passenger buses with only 7 spaces. Their best examples are Kia Sedona, Chrysler Voyager and Toyota Sienna.  Hybrid 7 seater cars - the most distinguished model is the Toyota Prius +. With an MPG of 65, it makes it a great choice for both space and lower fuel costs.  Luxury 7 seater cars - these cars are used for special occasions and are not seen very often. They will be mainly an option as a hire vehicle for a wedding or a funeral. Examples of such cars are the Bentley EXP 9 F and Mercedes Benz R Class. What to look at when buying a 7 seater car?  Engine size - the bigger the engine is, the faster the car will be. Also 7 seater cars need bigger engines than standard cars because of the extra weight they carry. In spite of this you will still be able to find 1.6 L to 5.0 L engine.  MPG - As with standard cars -- look out for the MPG numbers -- the higher -- the better.  Space - if you are planning to use up all the seats regularly make sure there is enough space for all passengers to sit and enjoy the ride comfortably.  Safety features - make sure all seats have all safety features on. For a detailed range and quality service go to the dealers themselves in person and try the car for yourself. Do ask for a test drive to see if you like it. One you've decided which car will be yours browse for prices online and compare. You may be able to knock off £5,000 the original price just by looking around. Visit Chrysler, Volvo, Jeep and Peugeot.